no child, forced or underpaid labour. 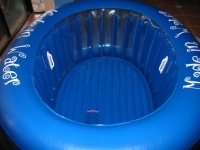 There will also be custom made liners available for this pool. Unfortunately, the new pool is going to cost a little more, and Simply Birth will now be donating $5 from every new pool sold to a fantastic birthing facility in Bali for Indonesian women. They provide an essential service to women and their families and to their knowledge is the only place in Indonesia that provides water birth to women. More details.